Avast has been the brilliant idea of two Czech researchers, who came up back in 1988 with what has grown into a popular online protection solution worldwide. After having recently celebrated their 25 year anniversary of working towards providing excellence in security for the web, it is only fair that we dive into the waters of Avast and conclude as to the strongest points and weaknesses of such software. So, stick with us during our review! Let us discover whether or not the popularity gained by Avast is justified or not! If you want to install Avast free antivirus, you will find it relieving not to be obliged to spend a whole lot of time or effort in it. Indeed, the whole installation process will not take up more than ten minutes. After having completed the download and installation, you will be encouraged to update your online protection level. It will appear outdated and thus you do not really have a choice. From then on, you will be displayed a small icon at the right side of your taskbar. Whenever you want to see more of the Avast, you can click on the icon and get the maximized display of your software at the center of the screen. Its interface is modern and cool though to some it may appear a bit more advanced than necessary. There is a useful and versatile column with all the features provided in an elegant fashion. You can customize the way all the pop-up notifications and other details like Avast anti-virus free update appear, which is quite nice as well! If you are looking for advanced technology and the latest prodigies in the field of online security, a word of advice; free anti-virus is not going to cut it, generally speaking! This is why there is such a list of features that are only available after upgrading to a premium version. This is what happens with Avast and the wonderful features, which you will only be allowed to use upon your decision to upgrade! Still, even the basic coverage can keep you away from dangers and threats online, as the antivirus software claims! If we wanted to point out both the weaknesses and top aspects of Avast free antivirus at the same time, we would analyze the recent findings of AV-Comparatives that demonstrate what Avast is capable of performing superbly and what needs some extra attention. Specifically, Avast has got 94% zero day malware attacks handled and this could have gone better. 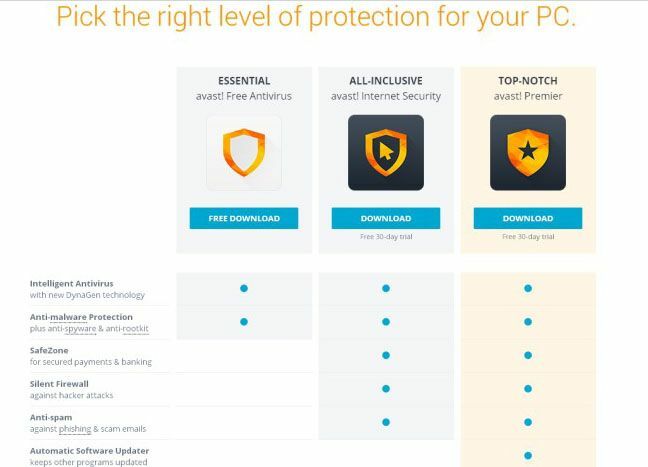 On the bright side, Avast prides in performing much better than most other competitors in online protection (2s whereas most require 5s). No false warnings and no false detections have occurred and therefore it is safe to say that Avast provides a safe pathway towards only getting alerts on threats that do exist! Real time protection is accomplished with the Web Shield, which scans websites as you browse them. Offline updating is also possible, which is certainly great news. Normally, there would be a place where the affordability of the anti-virus software was evaluated. Since this is a free version, you can see why we have skipped this part and we have moved on to the aspect of help and support. This is a wonderful aspect, when it comes to Avast, to say the least. To be more specific, you have got the opportunity to gaze through the FAQ section or the forums related to support. What is more, you can submit a ticket for support and be expected to hear from the pros as soon as possible (perhaps sooner than you would have anticipated). Last but not least, you can ask for help and even call them directly for answers. Overall, there is nothing left to chance regarding support and assistance. It is truly promising to find out that you have got a large selection of OS and devices to choose from and still get to install and use Avast free anti-virus software. Windows and Mac are fully compliant with the software and the features in full, while the mobile devices can benefit remarkably from what Avast has got to provide for them. With the continuous upgrades and updates, you will find no difficulty in finding which Avast free antivirus key is the one that suits your needs the most. A great deal of attention has been drawn to the field of mobile security from Avast. If you wish to go the extra mile, you are welcome to install the respective app that has received universal acclaim and ranks 4.5 out of 5 stars on Google Play. Avast free mobile security ensures that you get SMS and calls’ filtering options, tracking features and also checking your Wi-Fi usage among many other cool features and services aiming at the very same thing; your mobile is in need of extra help and this app definitely offers solutions, moving at that direction. Having reached the end of our review, we are in the safe position to state that the popularity of Avast is undoubtedly justified. It has been around for over 25 years, with a cool interface (which can be a bit complex for some people) and with exceptional performance levels. It ought to improve the zero-day malware detection percentage, which is one of the essential parts in online protection. Its mobile security features are remarkable and there are more and more people using mobile devices on a daily basis. Avast has been one of the most popular antivirus options internationally and there is good reason for that. Although zero-day anti-malware detection has not been what anticipated and there are features highlighted in the form of advertising the premium versions, the truth is that there is exquisite mobile use with special features allowing for offline updating and thorough control over viruses and other threats. It does not slow down your computer in any way and it is reliable, given its price.